Follow my exploits as I try to beat the bookies, find out what I fancy, download my latest mini-systems, get the stats for the next big meeting or catch up on the latest news in the world of horseracing. It’s all here! Not all bookmakers are created equal. Some are good, some are bad and some are downright ugly! Find out which bookmaker falls into which category. Plus new account incentives, special bet offers and any other bookmaker giveaways. FREE Guides for every reader! Whatever your level of betting expertise, you’re sure to find something of interest here – Finding value, speed ratings, in-running, paddock watching, staking plans, Spread – Take your betting to the next level! Route 66 – The Road To Cheltenham The groundbreaking NH Service that highlights 66 top race trials for Cheltenham. Trends, tips and the race’s importance in finding Festival winners. Plus result analysis to select the best Ante-Post bets. An ongoing mission to win at Life, in the Bookies and on the Poker tables! Gambling:- They say it's a hard way to make an easy living. I have been fascinated by horse-racing for all of my adult life (and some of my childhood) which is no surprise really as my father was a bookmaker for many years. After leaving college I went to work for Mecca bookmakers and then William Hill before setting up, in partnership with my brother, our own chain of betting shops under the name Gee & Gee Turf Accountants. From 1990 we had shops in Torquay, Paignton, Poole and Porthcawl before selling out in 2001. The next chapter of my life saw me take over the Nag Nag Nag Blog in 2008 from my great friend Matt Bisogno since when I've been regularly sharing my attempts to beat the bookies. I use stats, trends and good old fashioned 'form analysis' as the basis for all my betting and also for creating betting systems. And you can read it all for FREE on this 'ere Blog! 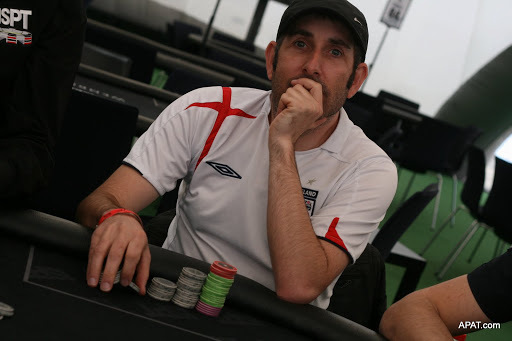 I really enjoy playing poker in my spare time and would classify myself as a ‘recreational amateur’ although I have had some success on the professional circuit including a 14th place finish in the Manchester leg of the Grosvenor UK Poker Tour. I also spent part of 2012 as a sponsored player for Genting Poker representing them in tournaments in Birmingham, Edinburgh and Stoke. In June 2013 I finished runner-up in the Welsh Poker Open and 3rd in the Welsh Amateur Championships. The following year I also managed to play in a poker tournament on the hallowed turf of Wembley Stadium! Back in 2007 I achieved my poker dream when winning a seat in the $10,000 World Series of Poker Main Event in Las Vegas. I followed this up in 2015 by winning an all-expenses paid trip to Las Vegas for that year's WSOP for one of the side events. The UK’s #1 Trends Betting Service. Experience a fun way of betting that gets great results. The best betting resource on the internet. Take advantage of their profitable racing tips, tools, reports and stats. The world’s largest betting exchange. Betfair Exchange allows you to back and lay on a wide variety of markets. In my last post before the Festival I took a look at the record of the previous years Cheltenham Festival winners and how they had got on the following year. The stats looked good and the results had been making nice profits over the last few years. It wasn’t to be profitable this year with only 3 Willie Mullins short priced favourites managing to follow up their wins from last years Cheltenham Festival (Vautour, Faugheen and Don Poli). Mares Hurdle: Glens Melody 6/1 – 2nd in last years Mares Hurdle. there were also a couple who stepped up from 3rd place last year to win last week…. and a lot that ran 4th or worse at last years Festival…. Meaning 13 of the 27 races were won by horses who had run at last years Festival. When you consider there are a few races where the winners couldn’t have run the previous year (4yo races and to a large extent the Bumper) it’s a big percentage and makes the previous Cheltenham Festival the first port of call when seeking the winners. In my stats book I included a section that looked at the tracks winners had raced at previously. At the bottom of the pile we saw that horses coming on from Huntingdon had the worst record of all with all 91 such horses getting beat since 2004. We can now add another 10 losers to this list as that’s how many horses got beat last week having had their prep run at Huntingdon. In fact all 10 finished unplaced including Fred Winter favourite Arabian Revolution, Jonjo O’Neills 11/1 shot Forthefunofit in the Martin Pipe Hurdle and quietly fancied Eduard in the RyanAir. The two tracks I highlighted as having the best record of all the tracks since 2004 were Cheltenham and Leopardstown. Last week they re-enforced their standing at the top of the table by providing 13 of the 27 winners (just under 50%)!! 4 of the 6 Cheltenham winners had their last start at the Trials meeting in late January (24th) including The Druids Nephew who won the Festival Handicap Chase on the first day of the Festival having run in the Cleeve Hurdle on trials day. Before I sign off, I must just mention my brother Gary and his tips for last week. Quite a few of you (actually a lot of you) signed up for his 4 big tips for the meeting in the hope he could keep his amazing Festival record going. We didn’t get off to the best start when his first runner Little Jon went from looking the likely winner jumping the last to finishing out of the placings thanks to stumbling on landing. Duke of Lucca paid the price for racing up with the pace throughout in the Cross Country and Peckhamecho ran like his odds suggested he would – terribly! Just as we were about to give up and a few dissenting voices were being heard he showed us just why he is rightly considered the King of The Outsiders! Taking us down to the wire with his 4th and final tip coming in the 27th of the 27 Festival races he salvaged my meeting, maintained his reputation and made a few hundred subscribers breath a huge sigh of relief as Next Sensation bounded up the hill to win at 16/1. Another fantastic tip that meant everyone of his readers came out in front on the week. Final word on the subject goes to DJ who summed it up perfectly when emailing to offer his congratulations……. Don’t know what planet your brothers on when it comes to picking horses but WOW ! I nearly didn’t back Wicklow Brave, I read the form and thought this has got no chance but happily my gamblers instinct kicked in and as I was having a oood Cheltenham anyway I had a £5 ew at 33/1 ( massive bet for me )……. Keep up the good work and I have recommended Gary and you to all my betting friends.